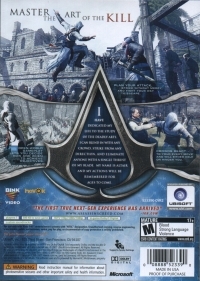 Description: The game's most innovative feature is the freedom of choice and movement. Every architectural detail like window ledges, carvings in the stone or wooden bars can be used to move on the walls. This allows the player to have intense chase scenes if by any chance you're hunted by the guard. Plan your attack, strike without mercy, and fight your way to escape. Open-world gameplay lets you decide how and when to achieve objectives. Crowds react to your every move and will either help or hinder you. 04-10-2013 artikskarab Box Text MASTER THE ART OF THE KILL I have dedicated my life to the study of the deadly arts. I can blend in with any crowd, strike from any direction, and eliminate anyone with a single thrust of my blade. My name is Altair and my actions will be remembered for ages to come. Plan your attack, strike without mercy, and fight your way to escape. Open-world gameplay lets you decide how and when to achieve objectives. Crowds react to your every move and will either help or hinder you. 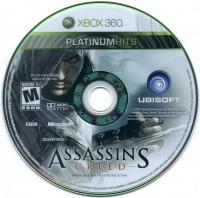 This is a list of VGCollect users who have Assassin's Creed - Platinum Hits in their Collection. 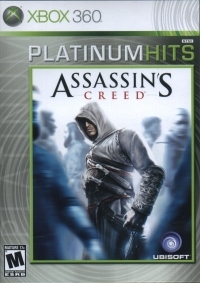 This is a list of VGCollect users who have Assassin's Creed - Platinum Hits in their Sell List. This is a list of VGCollect users who have Assassin's Creed - Platinum Hits in their Wish List.